"Lamingtons are little sponge cakes coated in chocolate and grated coconut. A traditional Australian treat that appeals to most. Any firm type of plain cake can be used: butter cake, pound cake, Madeira cake or genoise sponge. Note: desiccated coconut is a slightly dried shredded coconut--not sweetened." Preheat oven to 375 degrees F (190 degrees C). Grease and flour an 8x12-inch pan. Sift together the flour, baking powder, and salt. Set aside. Beat 1/2 cup butter and 3/4 cup sugar with an electric mixer in a large bowl until light and fluffy. The mixture should be noticeably lighter in color. Add the room-temperature eggs one at a time, allowing each egg to blend into the butter mixture before adding the next. Beat in the vanilla with the last egg. Pour in the flour mixture alternately with the milk, mixing until just incorporated. Pour batter into the prepared pan. Bake in the preheated oven until a toothpick inserted into the cake comes out clean, 30 to 40 minutes. Let stand 5 minutes, then turn out onto a wire rack and cool completely. Wrap with plastic wrap and store overnight at room temperature to give the cake a chance to firm up before slicing. To make the icing: In a large bowl, combine confectioners' sugar and cocoa. Add the melted butter and warm milk and mix well to create a fluid, but not too runny, icing. Cut the cake into 24 squares. Place parchment paper or waxed paper on a work surface, and set a wire rack on the paper. Pour the shredded coconut into a shallow bowl. Using a fork, dip each square into the icing, coating all sides, then roll it in the coconut. Place onto rack to dry. Continue until all lamingtons are coated. A delectable cake with just the right amount of sweetness! 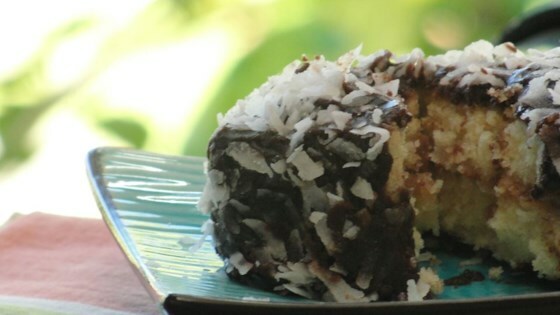 I am from Australia and this is a great Lamington recipe. These are traditionaly served split in half with cream in the middle, just like Nana used to make, yum. Thanks for the great recipe. delicious and a lot of fun to make with the kids! i'm an aussie and this recipe is authentic!